PORTLAND, Ore. (AP) Damian Lillard says Portland’s current streak is more about the Blazers than their opponents. CJ McCollum added 16 points for the Blazers, who have the longest current winning streak in the league. It’s the longest streak for the franchise since it won 13 in a row in December 2007. Portland (43-26) also earned its season-best ninth straight home win – a timely streak as it tries to hold on to third place in the Western Conference standings. Andre Drummond had 18 points and 22 rebounds in Detroit’s 12th consecutive road loss. Blake Griffin had 15 points. While Van Gundy said he didn’t want to take anything away from the Blazers, he said the officiating made their defense look good. He called the game embarrassing for the league. ”I’ve been here for four years and many more years before that and I’ve never come in after a game, never, never come in after a game and talked like this. That was embarrassing,” he said. The Pistons trailed by as many as 19 points in the third quarter, but they closed to 84-74 on Stanley Johnson’s dunk with 8:18 left. Evan Turner responded with a jumper for the Blazers. After extending the lead in the third quarter, Lillard went to the bench to start the fourth and it looked as if he might be done for the night. But he returned when Detroit got within 10 points. Pistons: It was the third of a six-game road trip. … Forward/Center Eric Moreland played at Oregon State. … Reggie Jackson, who has missed 35 games with a right ankle sprain, participated in a 3-on-3 optional practice earlier this week. Trail Blazers: Terry Stotts tied Nate McMillan for third-most victories as a Blazers coach. Stotts is 266-213. 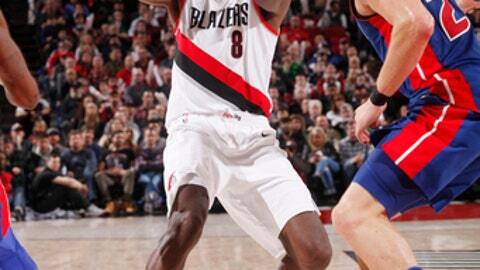 … The Blazers had lost five straight to the Pistons. … All five of Portland’s starters scored in double figures.